It happens late every August. Yet even after 24 years here, it can still catch me unawares. Content in my Eeyore stoicism towards Hobart’s winter, I am sure that the gloom of winter is still in full control. Then one day I notice the glow: feeble at first, and only on the odd tree. But within a week or two a slow tide of luminous gold begins washing up our valley. It starts close to sea level, and climaxes some weeks later not far below the Organ Pipes on Mt Wellington. 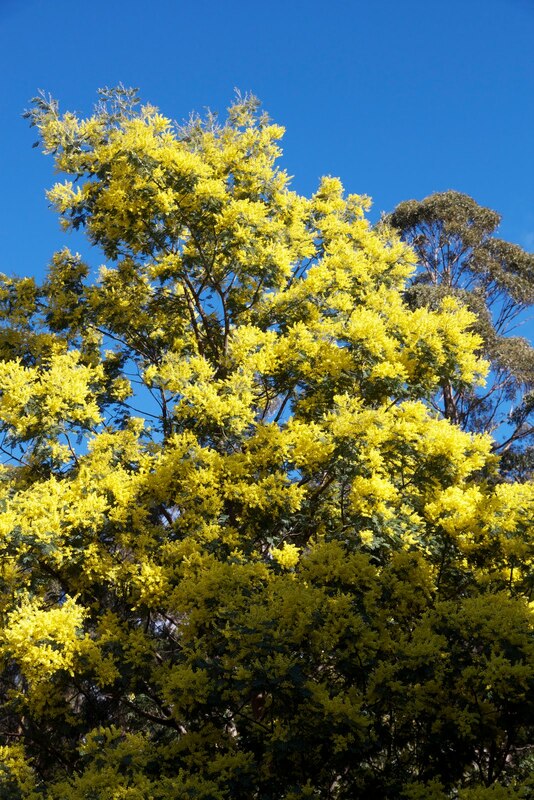 It is the annual blossoming of the silver wattle (Acacia dealbata) a common, quick growing and short lived tree. Although common (and disparaged as unspectacular in Wrigley and Fagg’s Australian Native Plants), silver wattle in spring seems to me a most wonderfully Australian tree. It is as though it has distilled summer’s sunshine, matured it through winter’s long dark nights and short cold days and then, come spring, has flung the sunshine willy-nilly onto every available branch. Each blossom – and there must be hundreds of thousands per tree – becomes a perfect sphere. But peer more closely and you’ll see that each globed blossom in turn contains globelets. As each of these matures, it unfolds, sending a radial burst outwards, giving each whole blossom the appearance of a Roman candle caught mid-explosion. Each blossom is in micro what the whole tree, indeed the whole landscape, becomes in macro: a slow explosive burst of spring exuberance. This botanical gusto extends to the blossom’s perfume. If, at first whiff, an individual blossom has only a faint scent, en masse the scent is altogether less modest. It fills the valley with a thickly sweet, almost dizzying tang. 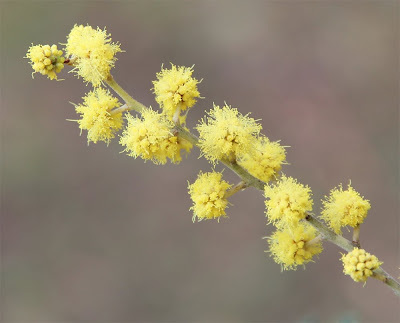 Taken together these sensory bursts make wattle blossom time one of the happiest and surest signs of spring. It is enough to turn any Eeyore into a Tigger. Vertebrates and invertebrates soon join the party, visiting the blossoms day and night. Moths, butterflies, beetles, bugs, bats, birds and even mammals feast on the distilled sunshine in one form or another. Perhaps they know, happy thoughts notwithstanding, that the flowering of the wattle is far from the end of winter. Without fail there will be more snow before the year is out. Eeyore can’t always be wrong. Peter -- What a pleasure to find this post in my mailbox this sunny Sunday morning in Toronto--where in fact I'm aware of shortening days and autumn leaning in. When I arrived in Hobart last year there was still some silver wattle blooming, but I'd missed its peak. Next time I come I'll have to arrange to catch the lovely wave you describe moving up from the coast. I like your alliterated list of creatures very much! I think your curiosity and delight with the yellow secrets in our valley are more like Piglet - the happy, inquisitive optimist! Wattle would probably make Eeyore sneeze and Tigger is far to bouncy to notice it.